How Were Guilin's Magical Mountains Formed? When you picture China, do you envisage mist-covered green mountains rising in sharp peaks and jagged edges? If so, you’re likely imagining the famous karst mountains of Guilin. They provide some of the most captivating scenery in China, but how exactly did these strange mountains get their shape? Karst mountains are made of limestone, dolomite, and gypsum, which have in common the fact that they are all soluble rocks. This means they can be easily broken down by certain acids, including the acids sometimes found in rainfall or in the surface water of rivers or lakes. Over time, acid breaks down the limestone and creates sinkholes and caverns, and subterranean drainage systems, where water will flow and collect under the ground. In the most dramatic instances, karst mountains are created when acidic waterflow wears down limestone bedrock, creating cracks in the bedrock surface. Once cracks are formed, water is then able to flow more quickly and with greater force, creating underground drainage paths, which, in turn, lead to greater erosion. With time—and not a short time, but rather, millions and millions of years—much of the surrounding rock will be eroded, and with vegetation taking root in the warmer tropical climates of southern China, the erosion process is hastened and limestone mountains are formed. 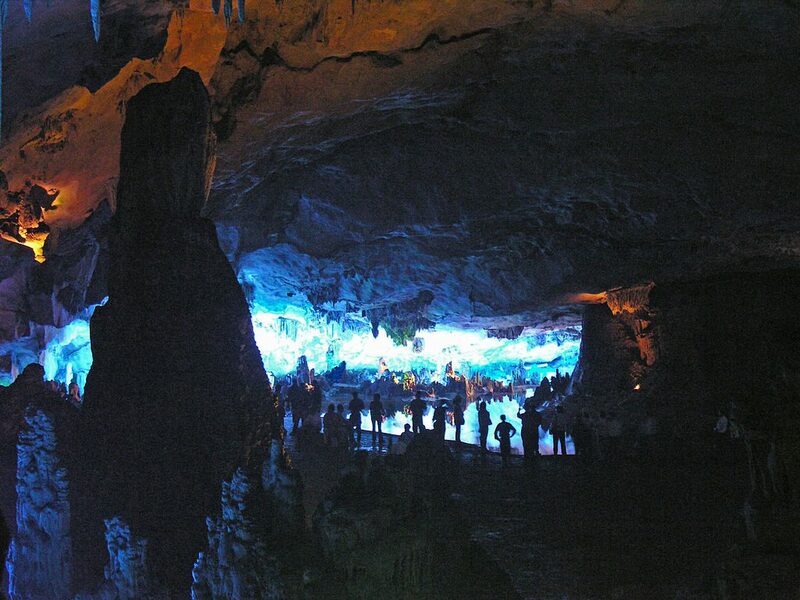 Karst topography is often characterized not only by sharp peaks, but also by caves and underground streams and pools, such as the famous Reed Flute Cave in Guilin. 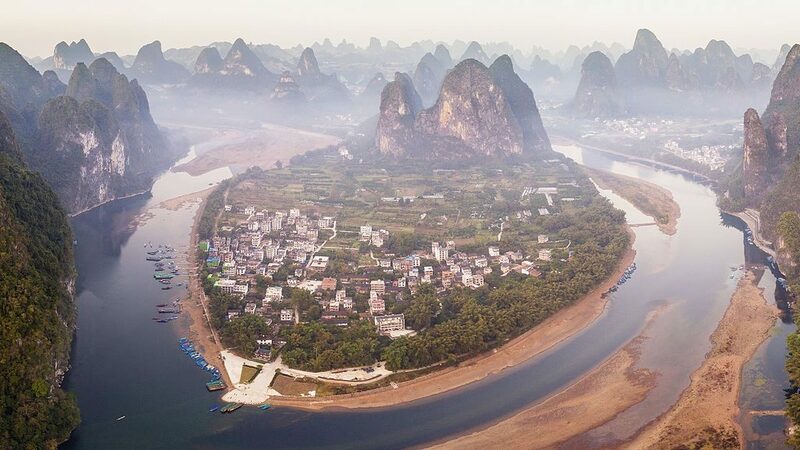 The area surrounding Guilin, including Yangshuo along the Li River, has some of the most beautiful karst mountains in the world. 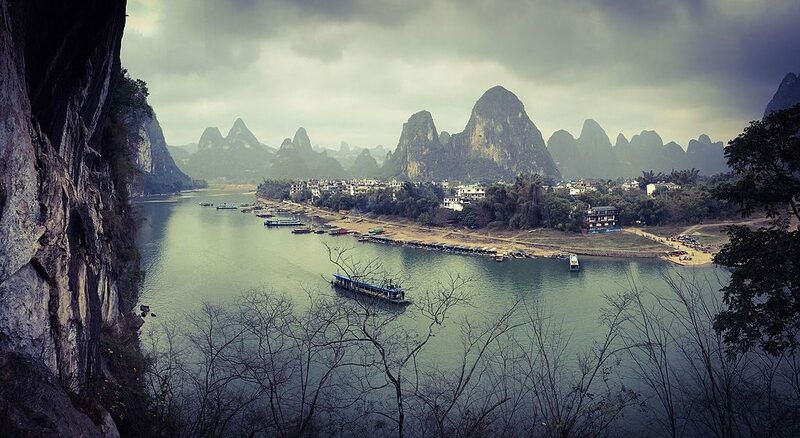 A cruise down the Li River or a bike ride through the countryside surrounding Yangshuo both provide great views of Guilin’s karst topography—an astute traveler should be able to spot the scene that appears on the 20RMB note, three karst peaks overlooking the Li River. Other famous formations in Guilin include Elephant Trunk Hill and Fubo Hill. 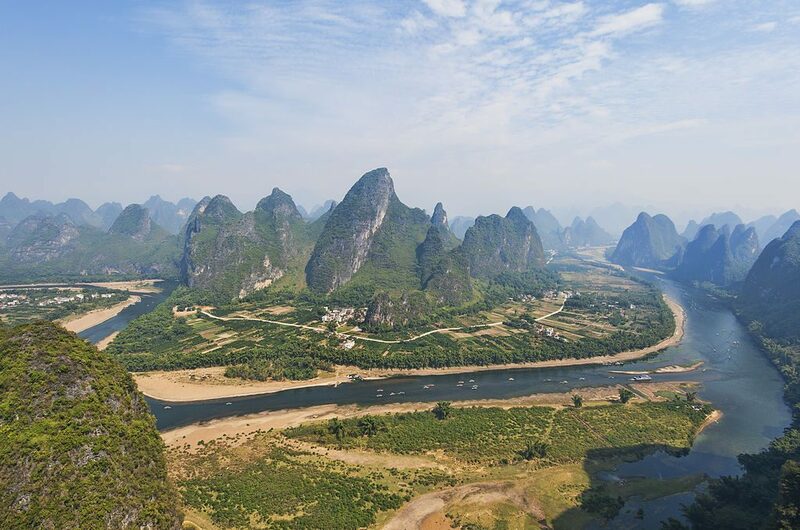 Guilin is any rock climbing enthusiast’s dream come true, with countless limestone peaks that vary in difficulty from beginner level, to some of the most difficult climbs in the world. 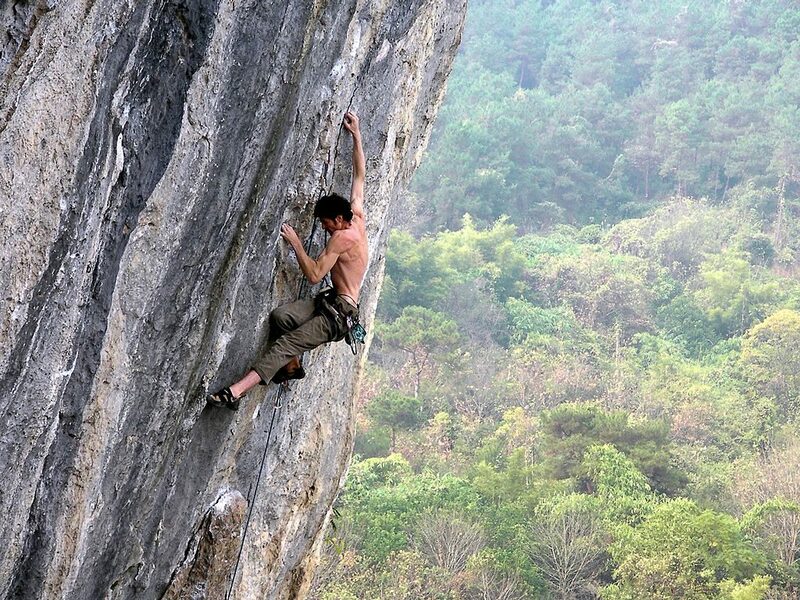 Guilin is China’s top spot for rock climbing, with hobbyists and pros alike drawn to the sheer limestone karst surfaces that can satisfy the rock climber’s desire for a technically difficult climb, without the high altitudes of other mountainous areas. Most of the best rock climbing peaks are located around Yangshuo, the most difficult of which is Moon Hill, a limestone arch that looks like a traditional moon-bridge. Although Guilin’s karst formations are examples of some of the most stunning karst scenery in the world, other places in Asia also have unique karst rocks that resemble those in Guilin. 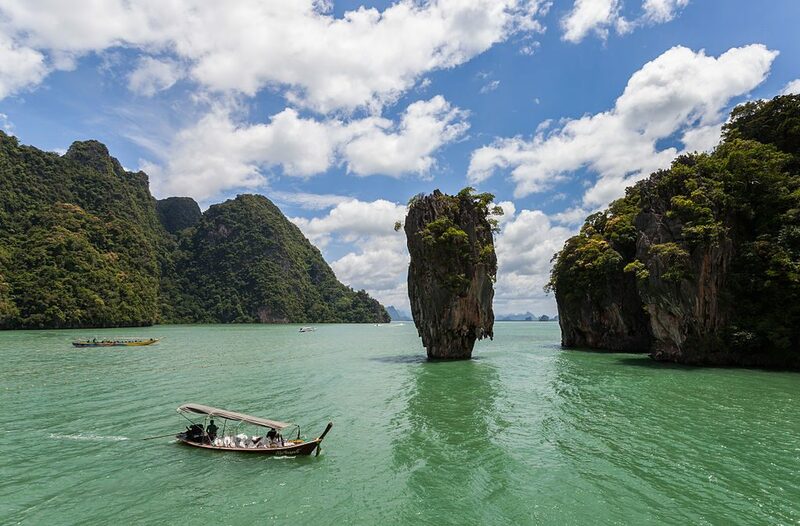 Ha Long Bay in Vietnam and Phang Nga Bay in Thailand both are home to karst hills, some of which rise up out of the ocean, making for breathtaking picture perfect sunsets. The Shilin Stone Forest in Yunnan province is also home to a karst landscape of densely packed limestone peaks.